The Yuma Fresh Vegetable Association's vegetable tasting program, Farm Fresh Forks, began in January at four restaurants in the Winter Vegetable Capital of the World, Yuma, AZ. Modeled after the wine tasting experience, customers may taste three different vegetables each week prepared in unique ways at each of the following restaurants: The Patio Restaurant & Bar, The Garden Café, Market Grill Steak & Seafood and River City Grill. The 12-week program highlights a different grower/shipper each week and three locally grown products. Chefs create tasting plates so guests have an opportunity to try local produce in a variety of recipes. The Patio Restaurant & Bar and Market Grill Steak & Seafood offers complimentary tastings every night through the end of March. They will also offer a full-size plate as an item on their specials menu for that week. The Garden Café features the produce in a weekly salad. They also offer complimentary tastings every day at lunch for those that want to try the salad of the week. River City Grill offers the local produce in a soup or salad every night of the week and it is complimentary when purchasing a meal. Following the biggest expansion in the company’s history with the opening of a second tasting room in Scottsdale and the purchase of a new space in Willcox, Carlson Creek Vineyards is keeping the momentum going with the recent purchase of a 120-acre plot of land in Willcox which neighbors their current vineyard and doubles their size. The family-owned winery sold the most grapes in their nine-year history during last year’s harvest, selling to 10 other Arizona wineries. The now 280-acre plot of land, situated at 4,200 feet above sea level (similar in terroir to that of Rhone, France) allows for the perfect balance of warm Arizona sun combined with crisp, cool evenings for growing wine grapes. Local farmers and environmental entrepreneurs, Lee and Ken Singh have just opened the all-new Singh Meadows in Tempe, a 72-acre organic oasis overflowing with fresh-plucked veggies, gourmet local foodstuffs and lush, lake-filled grounds. Open to the public on Saturdays and Sundays from 9 am to 3 pm, Singh Meadows also offers an on-site cafe and fresh juice bar, led by the culinary trio of Frank Belosic, Jay Bogsinske and Dan Medlen. The city of Tempe reached out to the Singh family in 2014 while considering new uses for a city-owned lot, formerly the longtime home of the Rio Salado Golf Course. The two and a half year process of transforming this patch of desert into an organic oasis started completely beneath the surface to remediate the soil and create the soil food web needed to grow nutrient dense heirloom vegetables. Singh Meadows is located at 1490 E. Weber Dr. in Tempe, AZ 85281. After more than a decade of bringing world-class music into private homes in Santa Cruz County, the Santa Cruz Foundation for the Performing Arts has just opened a permanent performance venue -the Benderly - Kendall Opera House in Patagonia, Arizona. The new venue will feature local musicians as well as internationally acclaimed performers. The Santa Cruz Foundation for the Performing Arts, a non-profit organization, presents high quality live performances of popular and classical music in area homes, historic sites and now at The Benderly – Kendall Opera House. There is a new option for staying within walking distance from the Discovery Center and the cave at Kartchner Caverns State Park in Benson. Four cabins have been built and opened within the park. Each two-room cabin sleeps up to six, with one queen bed and two sets of twin bunk beds. Mattresses are provided, guests supply their own linens or sleeping bags and pillows. Cabins have electricity, heat and air-conditioning and feature a table and four chairs, a mini-fridge and microwave. They also have a covered porch, picnic table, grill and a fire pit. Showers and restrooms are within walking distance. 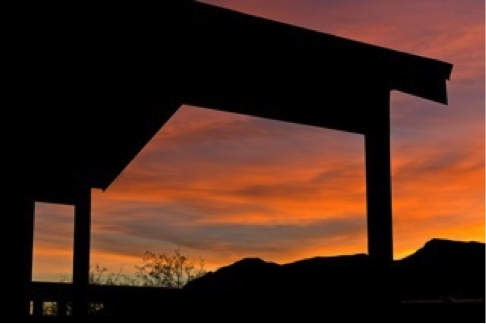 From the 8' x 13' elevated front porch and nearby hiking trails visitors can enjoy southern Arizona's desert sunrises and sunsets, and views of Mt. Glenn in the Dragoon Mountains to the East. Reservations are now being taken at 520-586-2283. The Arizona Peace Trail is a loop system utilizing existing off-road trails and roads in Western Arizona connecting Bullhead City to Yuma. The AZ Peace Trail was developed through partnership with more than 14 Off Highway Vehicle (OHV) clubs who worked with city, county, state and federal agencies to keep the trails open for public use and public awareness. 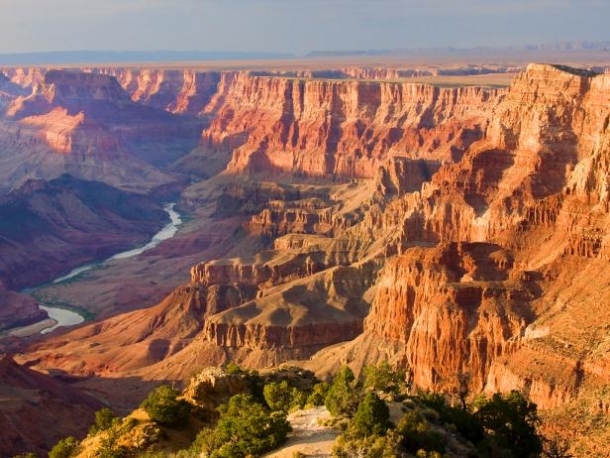 Signage is still being installed, but, when completed it will be one of the longest signed and mapped trail system offering more than 700 miles to explore untouched desert and wilderness with towering rock formations and wildlife. To fully complete the approximately 700 mile loop, takes five days. The AZ Peace Trail website references points of interests along the trail which include petroglyphs (intaglios), ghost towns, scenic stops and historic mines. The trail's elevation spans from 170ft to over 7,000 feet above sea level. The Mt. Lemmon Science Tour app has proved to be very popular in its first year. The app, created by the University of Arizona College of Science, Madden Media and Visit Tucson, has been downloaded 55,115 times since its launch one year ago. Signage installed along the Catalina Highway instructs app users when to begin their audio tours to sync the audio descriptions with drivers’ actual locations in the mountains. The Mt. Lemmon Science Tour app is available for free download at iTunes’ App Store for iPhone users and on Google Play for Android phone users. It is a great resource for residents and visitors alike. The app provides an audio guide to the science of the region's unique Sky Islands, stories about discoveries made in the Santa Catalina Mountains, slide-shows to interpret the trip, animated videos which explain complex science in an easy-to-understand way. It features music by the local band Calexico and narrated by their front-man Joey Burns. Spirit: “Window to Wellness” at Elements Wellness Center - Every morning, Elements Wellness Center offers a complimentary “Window to Wellness” experience from yoga classes to fitness walks and guided nature hikes to help jumpstart a day of adventures. 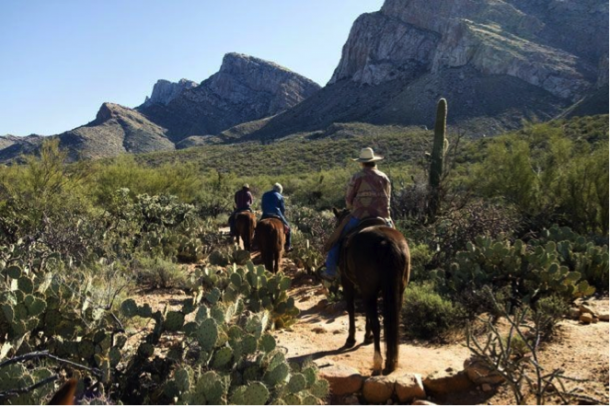 Body: Self- and Expert-Guided Hiking and Mountain Biking Tours: Explore the Sonoran Desert with more than 30 miles of marked bike paths and hiking trails through the Coronado National Forest and Catalina State Park. With trailheads located on the resort grounds, guests can access a variety of trail options from beginner to advanced skill levels. Guests can hit the trails with self-guided experiences on foot or on two wheels, with two hours of daily complimentary mountain bike rentals, included in their resort fee. Professionally guided desert mountain biking and hiking tours are also available, in partnership with Southwest Trekking. Mind: Guided Desert Horseback Rides: With “uniquely Southwest” experiences at the core of recent renovations, the resort has opened an on-site horse stable. Guests are encouraged to saddle up for guided trail rides and truly decompress, as it is said that interaction with horses naturally relieves stress, improves self-confidence and increases patience and focus. Updates to the Frank Lloyd Wright-designed ASU Gammage on the campus of Arizona State University are set for March 2017 completion. ASU Gammage, its donors and the community raised more than $9 million during the Elevate & Alleviate Campaign as part of the venue’s 50th Anniversary Golden Gammage Initiative to provide much needed improvements that included additional women's restroom facilities and two elevators allowing access to all levels. Due to its great food scene, Tucson was recently included on National Geographic’s list of Best Winter Trips 2017, the only American city on the list. Tucson's reputation as a top place to pedal was also mentioned. Tucson was selected by travelers as one of the top (#7) U.S. destinations on the rise, per TripAdvisor. Tucson’s history, culture, attractions, outdoor adventure, and the University of Arizona were prominently featured in the listing.